This is the Table of Contents for The GST HST in Canada Guide. It is The Bookkeepeer's Handy Reference to articles and sidebars on GST (goods and services tax) and HST (harmonized sales tax). 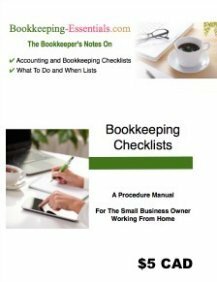 Then I'll wrap up with some commonly asked questions about HST and The Bookkeeping Forum questions and answers on GST/HST. Let me show you how to find the GST/HST paid in a transaction. Let's say you have a business in Ontario and purchased an item that cost $224.00 including sales tax. Sales tax in Ontario is 13% HST. You want to know how much of that $224.00 is sales tax. Here's how you do it. $224.00 (total purchase amount) / 1.13 = $198.23 (purchase price excluding sales tax) where / means divide. $200 x .13 = $25.77 (amount of HST paid) where x means multiply. If you live in a different province, replace .13 with your sales tax amount. Summary of current Canadian sales tax rates by province. There is a special rule that says if 90% or more of your supplies (sales to customers) were made through your permanent establishment (where your business resides), you can assume all supplies (sales to customers) were made in that province and use the appropriate participating/non-participating sales tax rate. What is GST HST in Canada? What is VAT? A short economics lesson because I find it interesting! Goods and services tax is a value added tax (VAT) on goods and services produced by businesses. This tax is passed along to the consumers of the products and services so sometimes it is also referred to as a consumption tax (as opposed to income tax which is a tax on your earnings). Harmonized sales tax is a combination of the federal GST along with a provincial sales taxcomponent. Instead of two separate taxes, it is a single value added tax. The HST is administered by the federal government who then remits to each participating province. Businesses operating in Canada are responsible for collecting both taxes and remitting the tax funds to the government ... which means they, not the government, bear the costs associated with the collection. ... VAT is a regressive tax ... if not combined with other tax strategies. Wikipedia describes a regressive tax as one that "imposes a greater burden (relative to resources) on the poor than on the rich - and there is an inverse relationship between thetax rate and the taxpayer's ability to pay as measured by assets, consumption, or income. What I find interesting in this is that I always thought of GST as a fairer tax than income tax because everyone has to pay it - rich or poor. The rich have more discretionary income so they spend more and they pay more tax. ... the tax is applied mainly to discretionary income which the consumer has control over ... so GST seems more progressive to me than regressive especially when compared to income taxes ... hmmm I'll have to do more research. If you are interested, I found a great article written by David Sherman, a leading GST tax expert in Canada. He is a tax lawyer. The article I found is on page 839 of the October 2009 Canadian Tax Journal publication titled Policy Forum: Tax-Included Pricing for HST-Are We There Yet?. It can be located at http://www.ctf.ca/ctfweb/Documents/PDF/2009ctj/09ctj4-policy.pdf. One of the points in his introduction explains that the United States is one of the few countries in the world that does not have a value added tax. Later in his article (the section is entitled: Tax-Included Pricing Is Better for the Economy), Mr. Sherman explains that tax experts and economists almost universally agree that GST is a "good" tax. Jack Millar wrote an article for the Canadian Tax Foundation in October 2009 with his case for maintaining tax exclusive pricing. The article is titled Policy Forum: The Case for Maintaining Tax-Exclusive Pricing. Mr. Millar points out that tax-exclusive pricing results in greater political accountability through increased tax consciousness by taxpayers. The article can be located at http://www.ctf.ca/ctfweb/Documents/PDF/2010ctj/10ctj1-millar.pdf. The thing I liked best about moving to HST in BC in 2010 and then transitioning back to PST in 2013 were all the articles written on the subject. 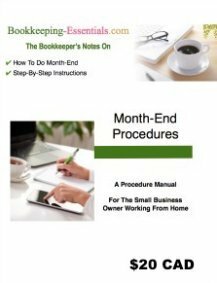 It gave me a much better understanding of the difference between the two types of tax ... which helps make my bookkeeping better. ... and Craig McInnes's (Vancouver Sun) September 27, 2010 article titled HST may not be costing you as much as you think - change to hated sales tax punishes big spenders the most was a good read but it is no longer available on the Vancouver Sun website. On September 1, 2010, The Fraser Institute issued an article that debunks 10 HST myths being propagated. The HST is tax neutral and not a tax grab as personal income tax cuts offset the gain. The HST will have virtually no impact on the average British Columbian and no impact on tax freedom day. The HST will not increase prices. In fact it will have little impact on prices as the removal of PST on business inputs works it way through the system. The HST broadens the tax base so some previously PST exempt items will increase (but not by 7%) and the price of items not PST exempt will drop. HST removes the preferential treatment of a few sectors. The HST will make previously hidden taxes visible and save businesses about $150 million in tax compliance costs annually. The BC government will save about $30 million annually in administration costs. You can read the whole report at fraserinstitute.org> reasearch & news>research topics> taxation> articles> No need to fear the HST. David Robertson, a tax lawyer with Fasken Martineau presented a paper in September 2005 at the CICA Commodity Tax Symposium entitled Sales Tax Harmonization: The Facts & Nothing But The Facts. The article concludes that when VAT is compared to RST, VAT wins. "As to the choice between which system is better, it is clear that the value-added tax system is superior as it (a) is more equitable, (b) less regressive, (c) minimizes cascading and double taxation, (d) promotes international competitiveness and domestic prosperity, and (e) is less susceptible to evasion." I've got two other chats based on notes from this document. They are How Governments Raise Tax Revenues and Compare and Contrast GST/HST in Canada to PST/RST. A copy of Mr. Robertson's article is available on the firm's web site, www.fasken.com. Fraser Institute economists published an article in the National Post titled Don't believe the anti-HST rhetoric. The Institute explains how HST works to our benefit. A basic lesson in economics and the HST published in the Globe and Mail is worth reading. I also found a 1993 paper by Richard Domingue titled The GST: An Overview of Some Alternatiaves. It is worth a read. BC voted to scrap the HST in August 2011. May 1, 2010 was an important date. New place of supply rules came into effect. The new GST HST place of supply rules now place a greater emphasis on the LOCATION of your customer NOT the location of the supplier. Generally, HST in Ontario and BC began to apply to any amount that was paid without having come due OR comes due ... if the amount related to the period July 1, 2010 or later. There were some exceptions. Take the time to review your bookkeeping work as there is a high probability CRA will be auditing transactions relating to the HST transition period of May 1 to June 30, 2010. BC then had another transition period when it reverted back to GST + PST on April 1, 2013. Q. Is my GST registration number now my HST registration number? A. Yes. Your GST registration automatically registers you for HST. HST registration for British Columbia and Ontario works exactly the same as GST registration with all the same rules as GST. Just be aware that as of May 1, 2010, there are new place of supply rules for GST and HST. Q. What is a non-participating province? A. A non-participating province is a province that does not charge HST ... they charge GST and may or may not charge a provincial sales tax. Currently, non-participating provinces are the three territories plus Alberta, Saskatchewan, Manitoba, and PEI. Q. What is a participating province? A. A participating province is a province that charges HST. As of July 1, 2010, participating provinces were BC, Ontario, New Brunswick, Nova Scotia, Newfoundland and Labrador. See participating provinces as of April 1, 2013 here. Q. What is the Quick Method rate for BC? A. You can find the Quick Method rates for BC and the other provinces on The GST HST Quick Method Rates page. You need to be aware that with the new place of supply rules, you will have different rates depending on the location of your customer in Canada. You may want to consider changing your method of reporting GST HST to CRA. 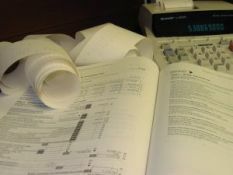 From a bookkeeping perspective, the Quick Method (and Simplified Method) is more difficult to apply than simply tracking the actual tax. Q. What are the GST HST invoicing requirements? A. GST HST invoicing requirements are discussed in How to Create an Audit Trail. You have three choices dependent on the value of the invoice. If you have point of sale rebates to invoice, you have three presentation options. Follow the links for more detailed information on GST HST invoicing requirements. Q. When is my monthly HST report due? A. Your monthly HST report is filed on the same report as your GST and has the same due dates / deadlines. Here are GST HST questions that have been asked in The Bookkeeping Forum. Feel free to check them out and give your opinion or share your expertise. As more questions are asked, more links will show up here. So if you have a question ... and are willing to be patient while I use my resources to learn along with you ... ask away. I would like to remind you there is a difference between information and advice. The information provided in this article or on this site should not be construed as advice. Please make yourself familiar with my disclaimer.